Welcome to Spanish Bike Tours. 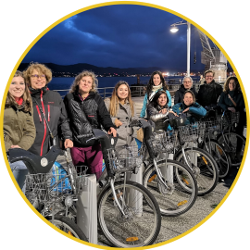 We are long-time experts in organising cycling tours in Spain, self-guided or small group tours. We arrange your route programme, your stay and your transfers... you only need to relax and enjoy!! Spain offers a stunning palette of possibilities: you can cycle along beautiful coastlines, mountainous terrain, open inland spaces or converted railway trails. The weather in our country is an asset, since you can cycle in Spain any time of year, and you can choose southern destinations for the winter months and cooler northern destinations for summer. Our culture and history can be experienced in every town or village and your cycling routes will FEEL like Mediterranean Spain, Southern Spain, Green Spain, the Islands…. And, last but not least, our cuisine is a mixture of the many cultures who have inhabited the peninsula throughout the centuries; tasty, local, fresh and original and the best way to replenish your energy after a full day of cycling through Spanish landscapes.